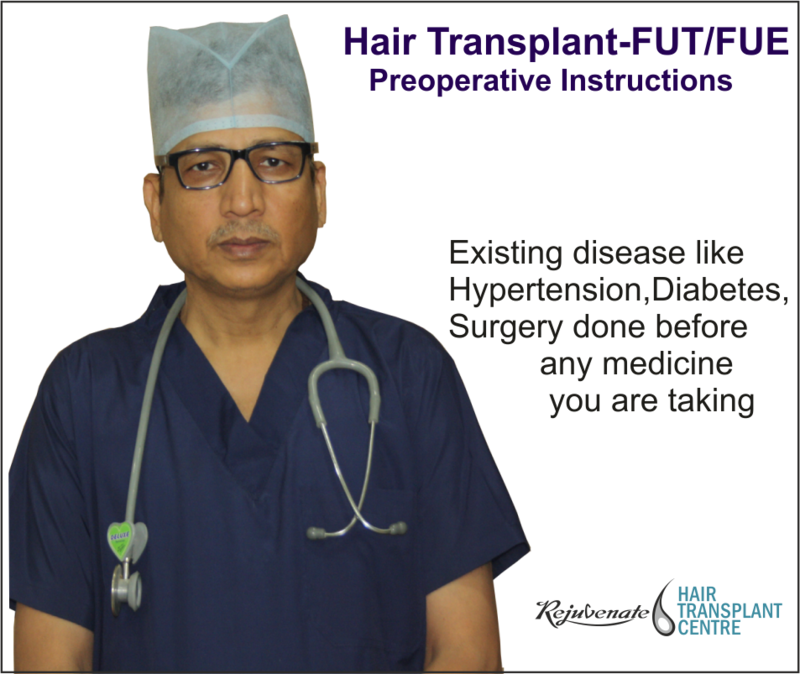 Rejuvenate hair transplant center Indore India gives detail instruction to all patients before going for FUT or FUE. Some of the important aspects in preparation for hair transplant surgery are given here. Always seek full information about the procedure from your Doctor. Inform your doctor of any known allergies, previous surgeries and other medications you are following. Blood pressure medicines, antiepileptic medicines, diabetes medicines are to be continued. If you are taking B Blocker (eg.propranolol) for hypertension, please inform us. Morning doses to be taken on the day of the surgery. We recommend taking vitamin c 1000mg, 3 times per day, since this may help with healing and also decrease the chance for bleeding during the procedure. Stop Aspirin, anticoagulants and hair growth medicines 10 days before the surgery. And stop Minoxidil like – Mintop, Rogain, and Tugain 10 days before surgery. Smoking or use of tobacco in any form should be stopped 2 months before surgery. Alcohol intake should be stopped before 48 hours of surgery. If you are a bodybuilder or do strenuous cardio exercises, please refrain from those activities for 3 days prior to surgery to decrease the risk of bleeding during and after hair transplant surgery. You can do light exercises, walking and stretching without restrictions. For FUT (Follicular Unit Transplant) you can massage the donor area (scalp) at least 1 week before surgery for approximately 10 minutes or better 30 minutes per day. In order to soften the skin in this area, this will facilitate the removal of the strip and will reduce any tension that you may feel at the level of the scar after your surgery. This message will help you to increase the skin’s elasticity. For patients undergoing an FUE procedure please note in most cases the entire head must be shaved to a blade 0 on the day of the procedure. Do not wear T-shirts, pullovers on the day of hair transplant. Wear the comfortable loose button or zip down shirt. Have light food before coming to the hospital. If you have any query before surgery please contact your doctor. Lab tests are very important to be done before the hair transplant. Other medical tests may be added as per your pre-existing conditions.